Earth Contact Products’ Steel Piers™ were selected to support a process heating unit at a major refinery after ground-penetrating radar discovered significant voids and saturated subsurface soil conditions near the foundation. Subsequent investigatory work reported a leaking water line adjacent to the unit. 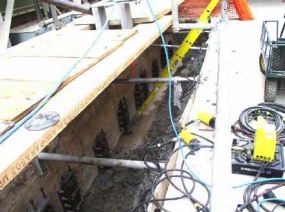 The owner determined that the entire 2,288,000 pound structure would be in jeopardy unless deep foundation piers and void filling were installed to provide uniform supplemental support. 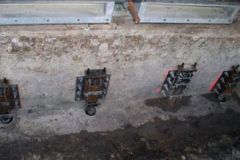 ECP Model 350-WM Steel Piers™ were recommended for installation around the perimeter of the heater foundation. This wall mounted pier system was selected because it provides ease of installation with the bracket being bolted to the stem wall and the pier pipe installed through a 5-inch diameter hole that was drilled through the footing element. 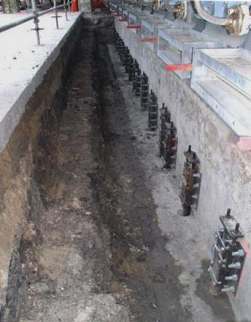 Each pier was advanced through the soil until the pier encountered firm load bearing. Once firm bearing was reached, each ECP Steel Pier™ was field load tested to a proof load or test force averaging 59,100 pounds. 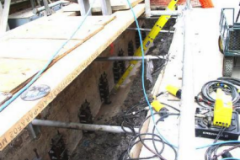 This method of individually testing each pier after reaching end resistance verified that the bearing stratum was suitable for long-term support. Load testing also determined the factor of safety for each pier placement against future settlement. Test results confirmed, on average, load capacities at least 40% percent above the working load requirements. 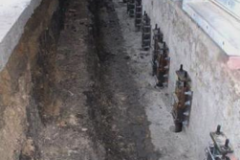 was no more than 3 to 4 feet below grade, it was recommended that the contractor install 4-inch diameter sleeving over the 3-1/2 inch diameter pier pipe within the upper 14 feet of soil. 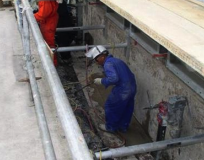 This exterior sleeving provided additional support for the segmented joints in the pier pipe through areas with voids or through the weak saturated soil. The sleeving increased the moment of inertia, or resistance to buckling, of the pier system by 299%! Once all piers were installed and the load-bearing capacity verified, the structural load was transferred from the footing to the piers. The piers now carry an average working load of 42,300 pounds providing a total additional support to the heater unit of 2,792,000 pounds! Following the load transfer, the voids were injected with industrial urethane. Not only did the urethane fill the voids, but it also helped to provide additional support under the center line of the foundation element. During the whole process, there was minimal disturbance to the refining activities. 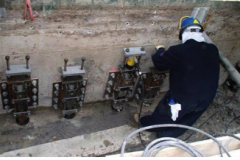 ECP Steel Piers™ were rapidly installed using quiet, vibration-free hydraulics, which allowed the repair process to progress quickly with minimal downtime or loss of production for the customer. Photographs: At the top is a view showing two heater units at the right side of the photograph. Unit H-2 is nearest. This is the unit where saturated soil and voids were detected near the footing. 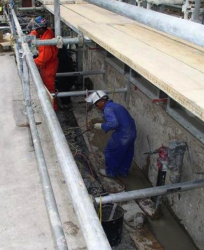 At right the technicians are preparing the footing to accept the pier pipe. The photographs below show the ECP Model 350-WM Pier Systems installed to the stem wall of the heater. 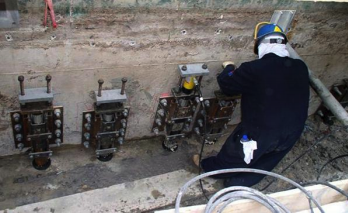 The technician below right is transferring the working load from the foundation to the pier system. Photographs: Here we see the finished installation. 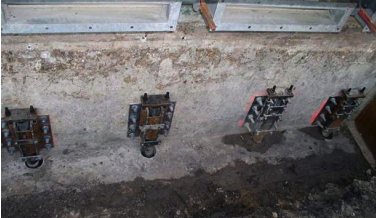 The pier brackets were installed 30 inches apart around the stem wall of the foundation. Each pier system is supporting an average of 42,300 pounds. « Spring is Coming, Are You Ready?